I am a 38 year old musician and sailor from Gothenburg. I spent my whole adult life living in London since the age of 19, but last year I finally moved back home to my roots in Sweden. I have always been obsessed with water and boats and I paddled canoe as soon as I was big enough to hold onto the paddle. 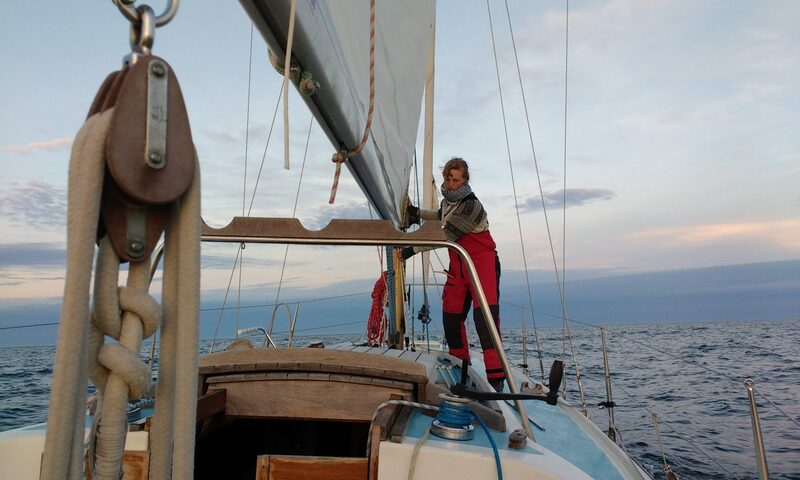 I learned to sail at 10 and then bought my first boat Tejde – a yellow optimist in which I explored the bay of Svanesund, Orust where we lived. With the money from my first summer job I upgraded to a ‘Stortriss’ at the age of 16. In this lovely little boat of 5.25 meters I ventured out further and further along the west coast of Sweden in the company of my dog and friends. The last 18 years I have sailed and loved Elinor, a 24 foot Hallberg Rassy Misil 1 during my summer holiday in Sweden, alone and in company. We explored the west coast and sailed across to Norway and Denmark. Further sailing experience include crossing the mediteranean and sailing along the English coast. In London I lived on board a 58 foot Narrow Boat, hilariously called Miss Behavin. I cruised the canals of London as part of a big and wonderful community of other boaters. So my life has always spun around boats and I feel as though the sea runs in my blood and I adore the feeling of floating in a vessel on water.